Turning passion into action with the nation’s most effective animal protection organization. The Humane Society of the United States isn’t your local humane society or pet adoption center. Their mission is to end all forms of animal cruelty. 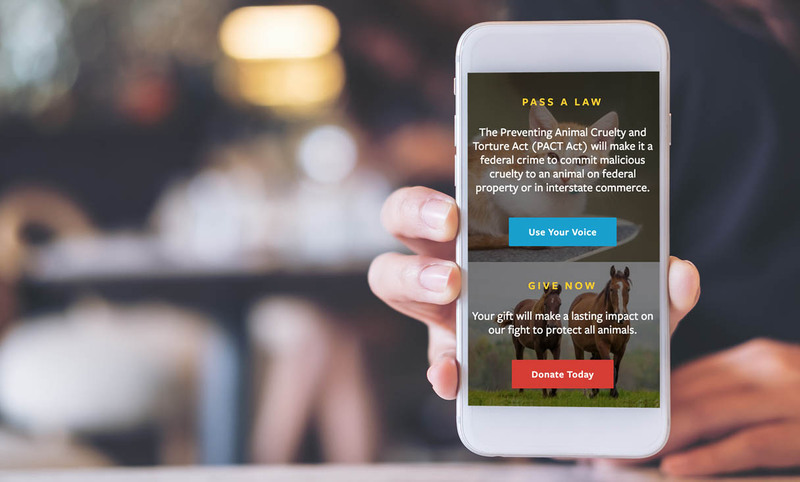 From puppy mills to animal testing, and from trophy hunting to horse slaughter, they take on powerful forces like multibillion dollar industries and systemic governmental policies to bring about a more humane society for us all. The Humane Society of the United States fights so many big fights spanning across issue areas and all 50 states. 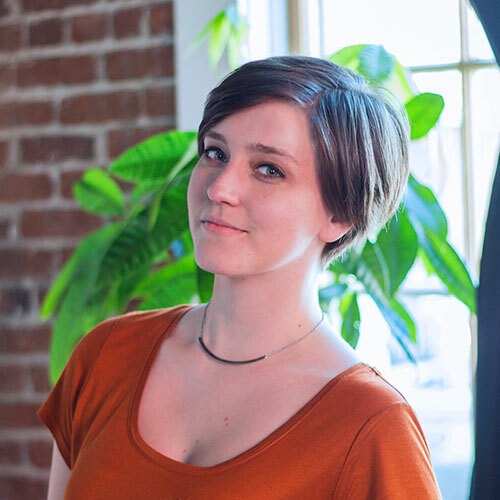 With such important but complex work, people were struggling to connect with the mission, and the website was suffering from content overload. 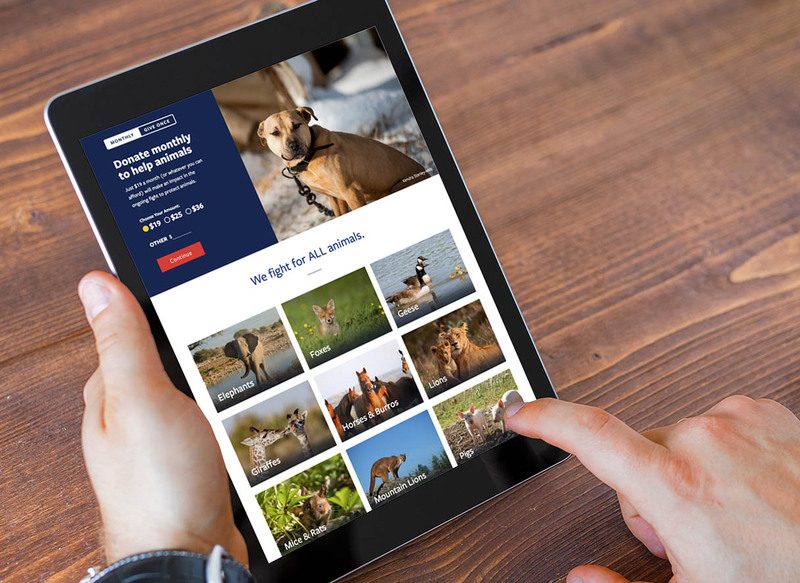 We launched a stunning new website based in extensive user research that brought their new brand direction to life, streamlined and focused the content, and gave the Humane Society their first truly custom site complete with features and functionality tailored to meet their big goals. The new website is already providing value to the Humane Society’s rebranding efforts. As the organization’s single-most important brand touchpoint, it is clear that visitors are better understanding the mission, engaging with their work at a new level, and looking more into how to get involved. Our audience research included comprehensive interviews and surveys of thousands of stakeholders — internal and external, current and lapsed. From this research, we uncovered a common desire across audiences to be invited into the larger story of the Humane Society of the United States (HSUS). People wanted a richer understanding of their daily work and the impact of that work. But they weren’t finding the stories they wanted; they were buried amid outdated or unrelated content. To address this, we capitalized on the organization’s decision to emphasize their “big fights.” We outlined a strategy that brought every site visit to within a single click of action, so that no matter whether a visitor came from search, email, or banner ad, they would have an immediate way to understand the work of HSUS, and join the fight to end animal cruelty. Our designers executed on the updated Humane Society of the United States brand — and did it mobile-first. 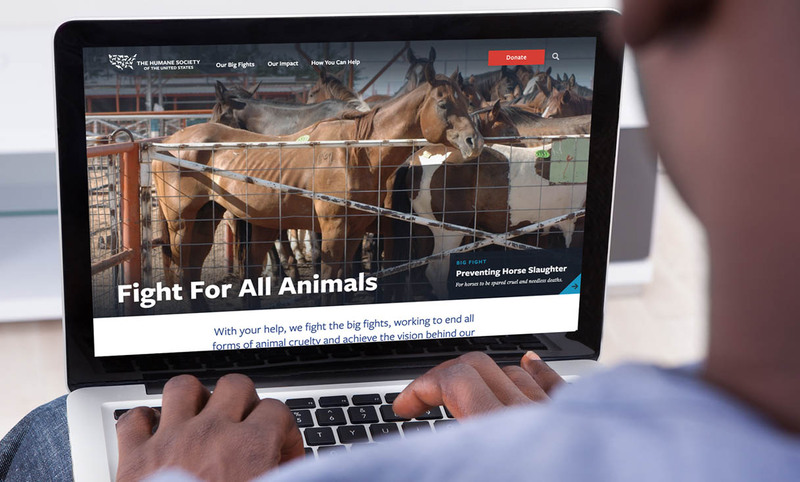 While we were working on the redesign of the website, HSUS was going through a comprehensive rebranding that required a bold new design. We introduced powerful visual storytelling tools from videos and photos to strategic uses of typography and color. The new site also united two separate sites for desktop and mobile as one fully-responsive site. The old mobile site was outdated in mobile-first technology, and caused problems with site maintenance and performance reporting. 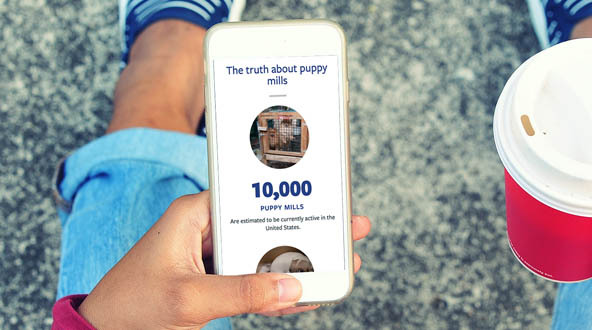 Content on the new humanesociety.org was designed for mobile interaction from the ground up. We focused on defining clear goals for every interface, and designing user experiences that encouraged and fostered deeper user engagement into and across the site. We provided the technological building blocks of success, from better back-end controls to innovative front-end features. 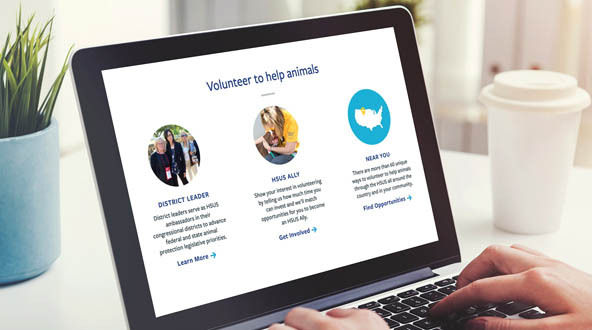 By moving humanesociety.org to Drupal, their team now has a completely custom website for the first time in recent memory, with features and controls that allow them to make visiting the new website a totally on-brand, unique, and compelling experience. 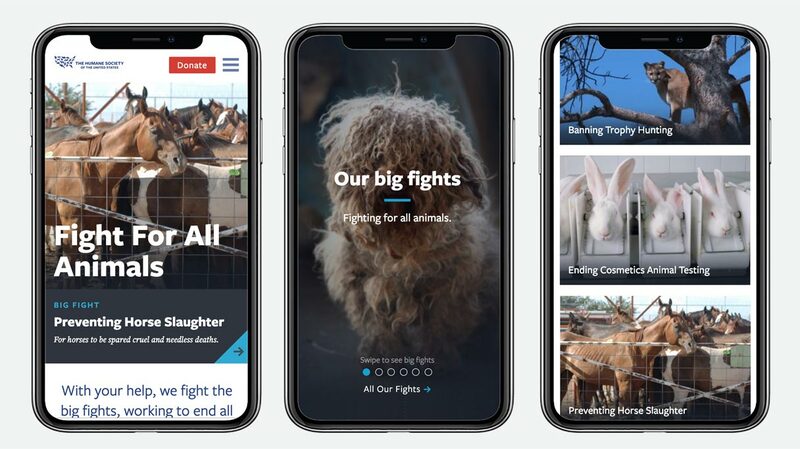 For example, in order to showcase their Big Fights in a meaningful way, we implemented cinemagraphs on those key pages — animated images that bring the animal to life right in front of your eyes. We also built exciting new popup functionality that slides in to the user’s view and then repeats further down the page, all completely customizable on a page-by-page basis. Branding Efforts Deserve Nothing Less Than the Best Website. An organization’s website is its single-most important brand touchpoint. When a brand is refreshed or redesigned, a website can make or break the realization of that new brand. We are committed to aligning every website strategy to our clients’ brand strategy. 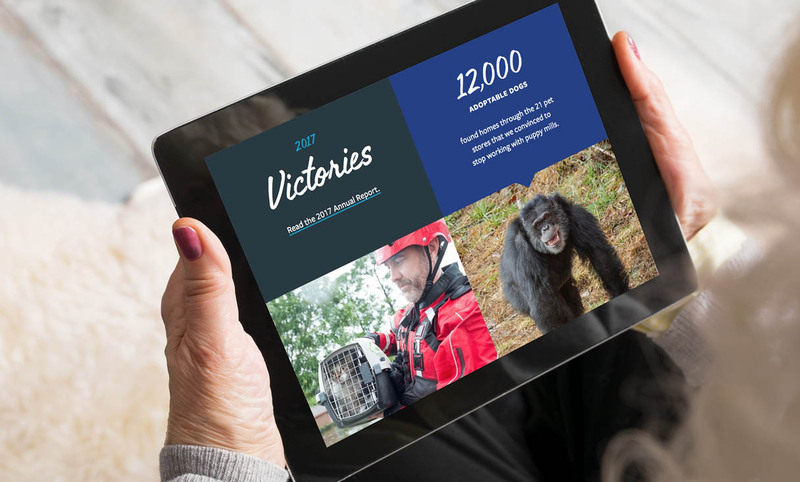 For HSUS, we figured out how to take a beautiful brand concept and design a cohesive digital execution. In strategy and technical functionality, we identified and built the structures needed for that brand to thrive. In these critical first months, the brand has been received with great excitement. We know that will only continue to increase as it is adopted by more established and new audiences.